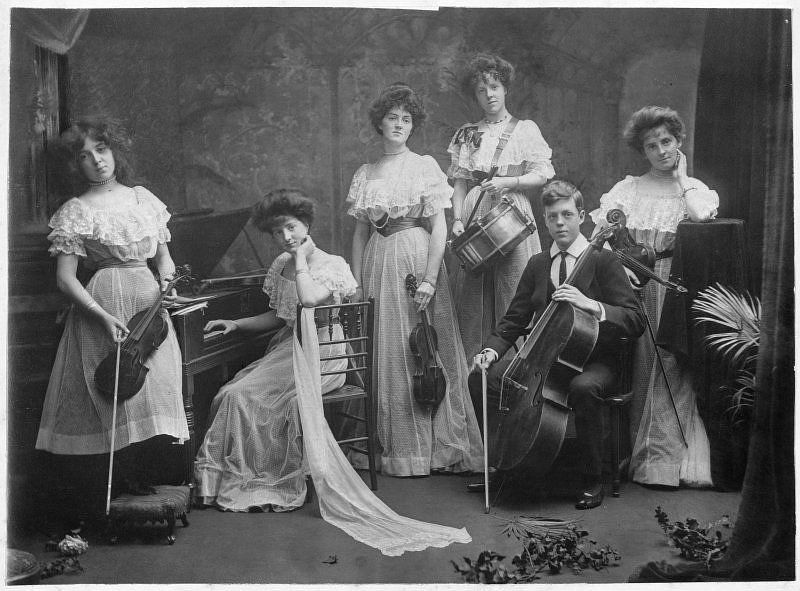 The Edwardian era was a time of unprecedented social and political revolution in Britain. By the start of the new century, the country had reached a level of such general prosperity that, for the first time, working men and women were in a position to both argue and agitate for a share of the wealth. 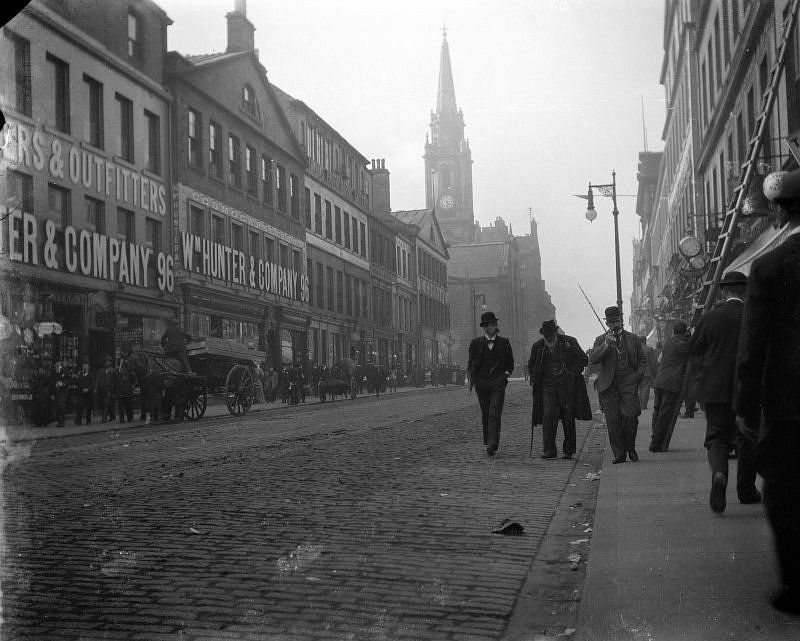 In Scotland, at the centre of the incredible manufacturing clamour of industrial Glasgow, a worker army was banding together as a political movement demanding votes for all men. Trade unionists and women campaigned for what they regarded as their natural rights. All demanded a radical change to society. The establishment listened, and came to accept that the future success of the nation would depend on a better educated and emancipated working class. The period teemed with innovation, from the cinema, wireless radio and mass use of the telephone, to the invention of the turbine engine, advances in physics and the achievement of powered flight. With a new age came the freedom to explore new ideas – the genius of Charles Rennie Mackintosh emerged from the Arts and Crafts movement, revolutionising design and pioneering the beginnings of modernism. The old order was slipping away. For the wealthy, the Edwardian era was characterised by the ‘Golden Age’ of the country house – the long weekends of parties and field sports. Rather than the preserve of the aristocracy, these trappings of privilege were enjoyed increasingly by a class of aspirational and newly affluent merchants and industrialists. Yet in a few short years, these halcyon days would give way to the sale, dispersal and destruction of many Scottish estates. These pictures from monovisions that provide a fascinating glimpse into a remarkable period in our history. 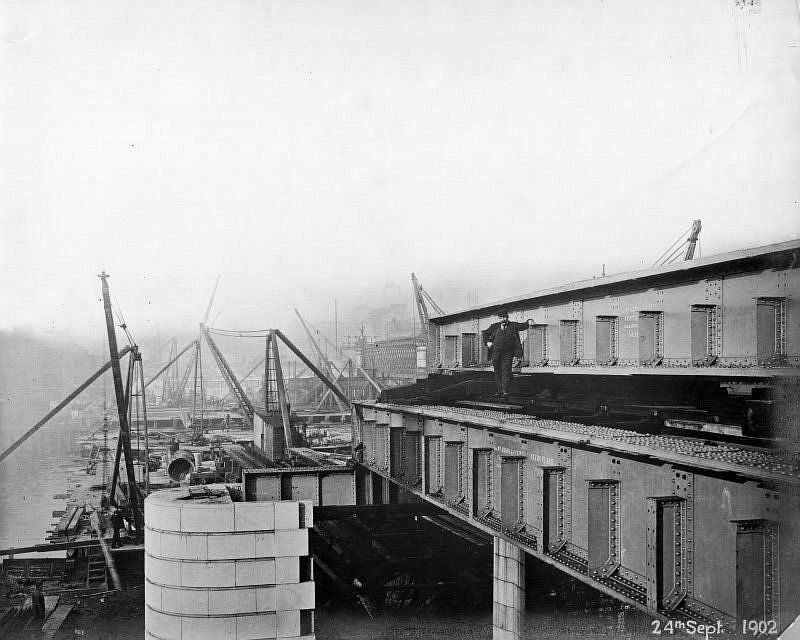 View from Clyde Place, Glasgow of the Central Station Bridge during construction, September 1902 (completed 1905). This was built for the Caledonian Railway Company to their design as part of the reconstruction of the Station. 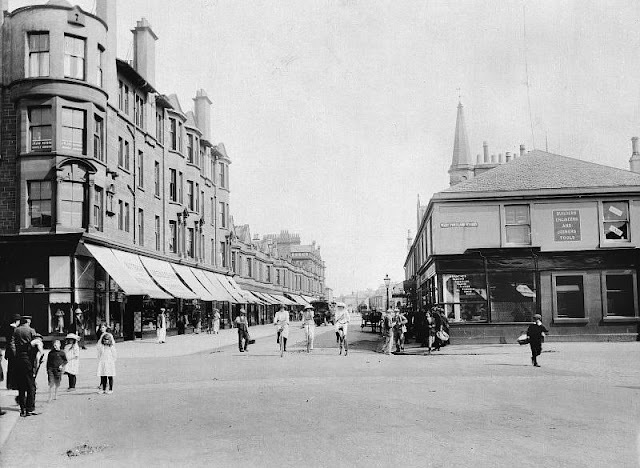 Photograph showing Ayr Street, Troon on the corner to West Portland Street, c.1910. 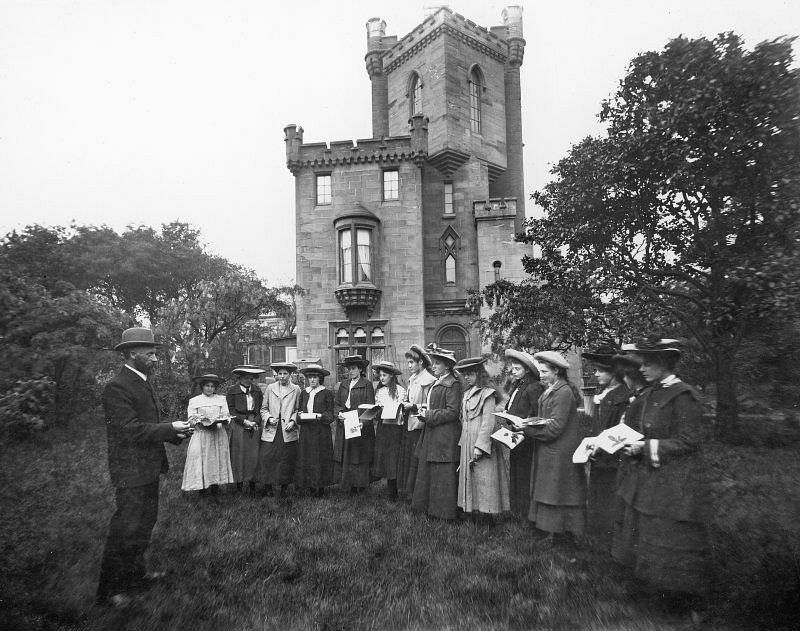 Group outside St John the Baptist’s Church, Ayr, c.1906. 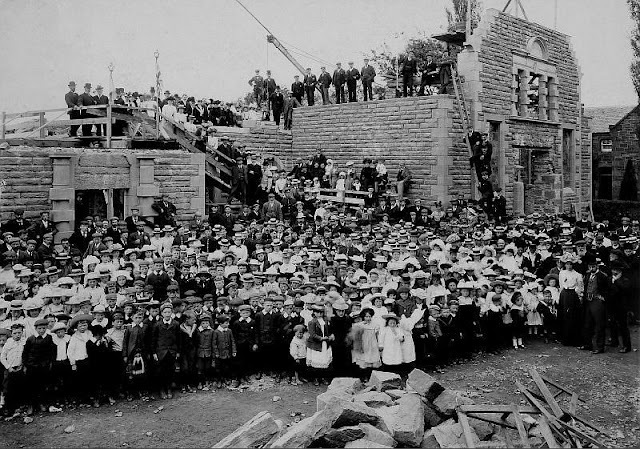 Crowd in front of the Phipps Institute, Beauly, under construction, c. 1903. South Bridge, Edinburgh, from South East showing street scene with horses and carts, c. 1910. 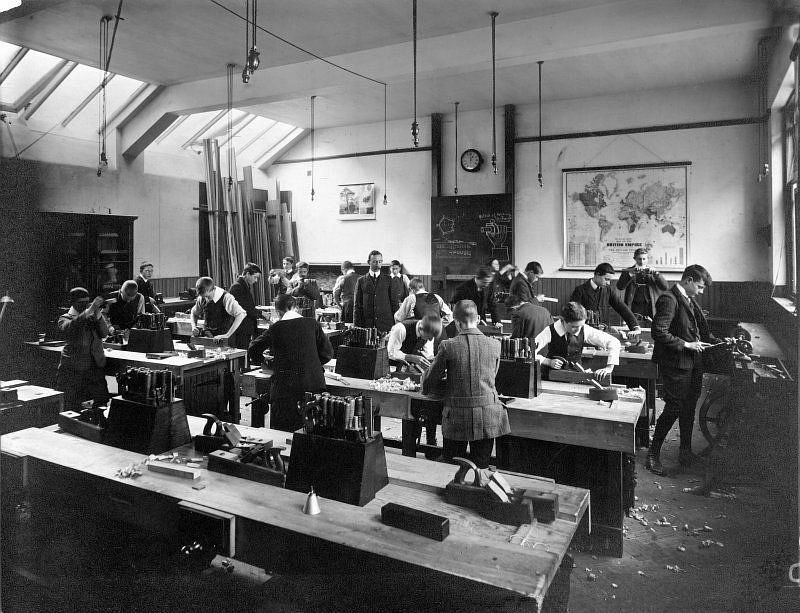 Male pupils in a woodwork class at unidentified school run by the Edinburgh Merchant Company, c. 1910. 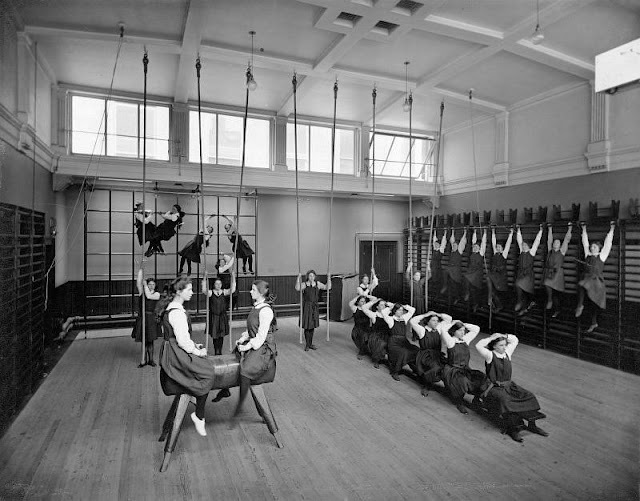 Female pupils in the Gymnasium of unidentified school run by the Edinburgh Merchant Company, c. 1900. 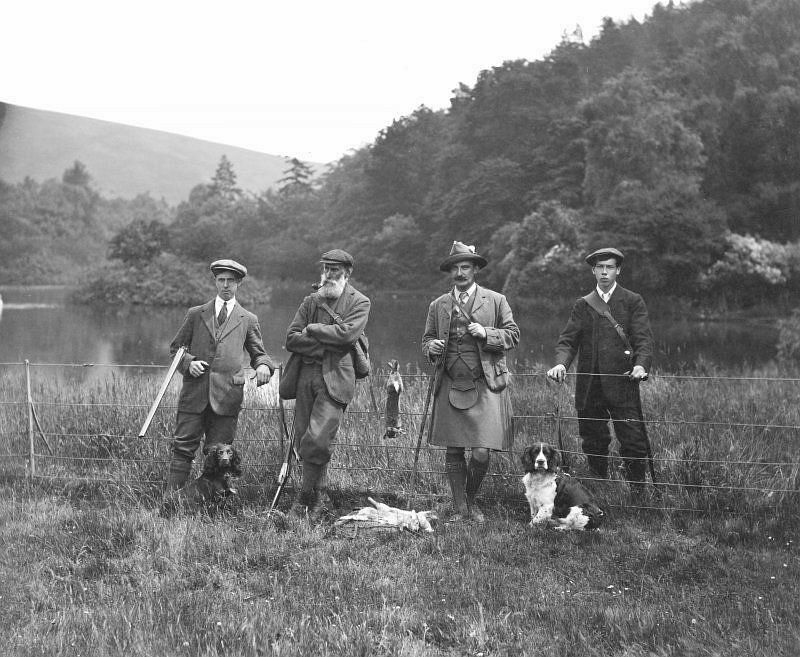 A hunting party on The Glen estate, c.1907. High Street between Canongate and North Bridge, Edinburgh showing no 153 Allan Ramsay’s House, The Temperance Hotel, no 143 The Gun’Temperance and The Gun Coffee House, c. 1900. 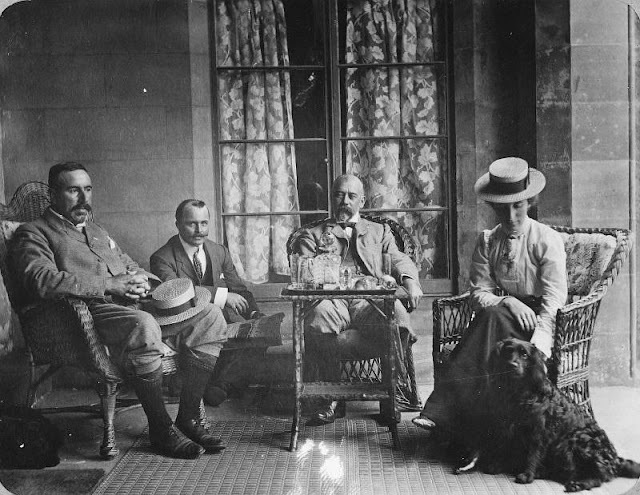 Group in the loggia, Inchrye Abbey, c. 1900. 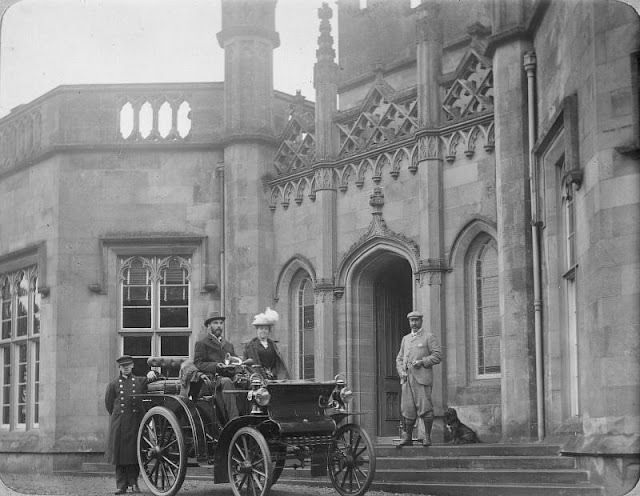 Inchrye Abbey entrance with couple in automobile, c. 1900. View of High Street, South Queensferry, 1907. 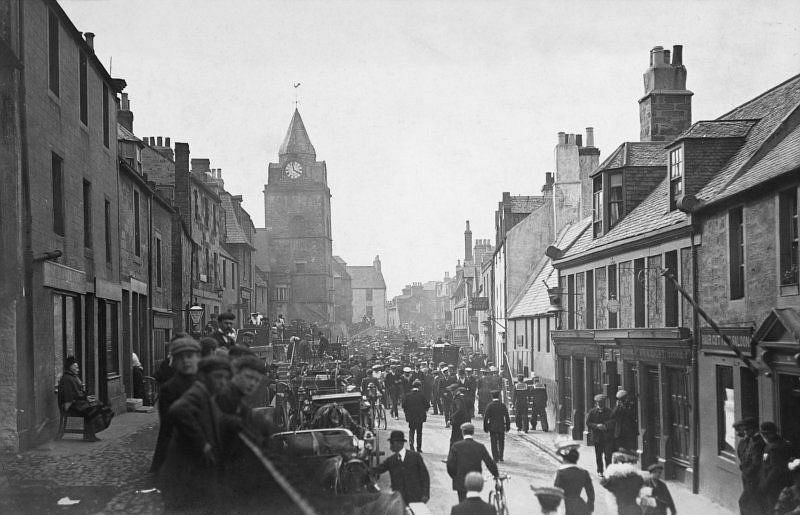 Titled: ‘South Queensferry, Channel Fleet visit 1907’. 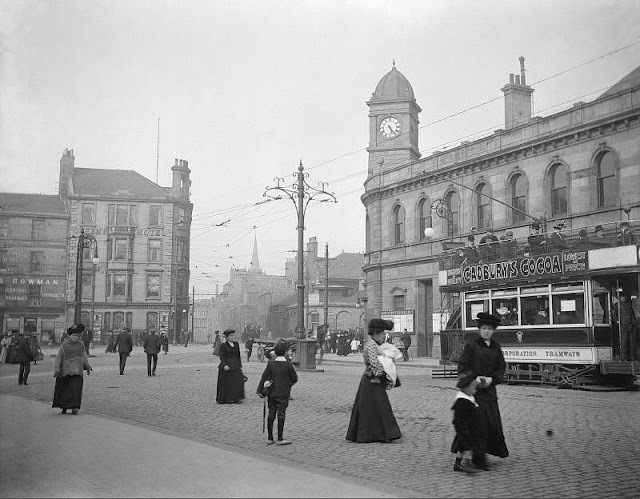 View of Leith Central Station, Edinburgh, from Leith Walk, with street scene and tram advertising Cadbury’s Cocoa, 1912. The station opened in 1903 and closed for regular passenger traffic in 1952. 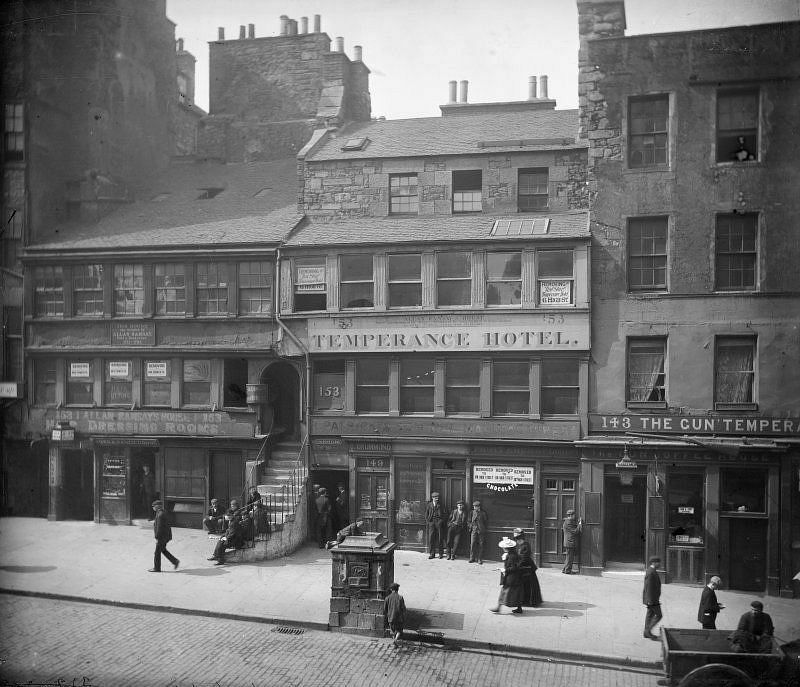 Visible is also the Queen’s Hotel. View of Edinburgh at night, 1907. Titled: ‘Candlemakers Row and George IV Bridge April 1907’. 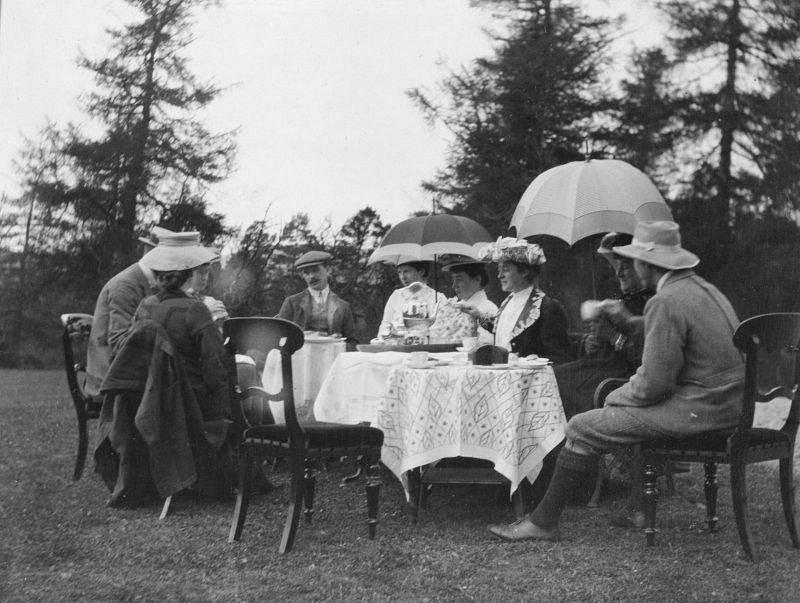 Teaparty in unidentified garden (probably Achernack,Strathdon), c. 1906. 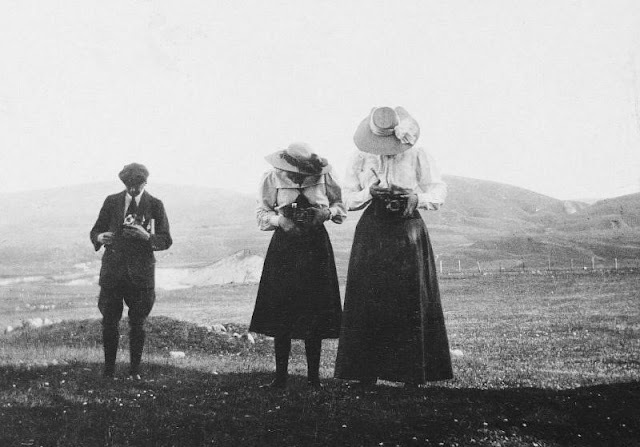 Two women and a man with cameras, 1907. Titled: ‘A Henderson, Gladys Younger, J Henderson’. Members of the Mather family with instruments, c.1910.